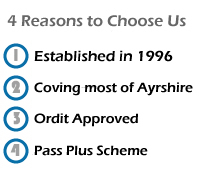 Tricia Moir School of Motoring has been established since 1996 and I’m a Grade A Instructor we cover Irvine, Saltcoats, Stevenston, Ardrossan, Ayr, Prestwick, Troon, Dalry, Beith, Kilbirnie, Kilmarnock, Kilwinning and surrounding areas. We will help you learn your theory, hazard perception and prepare you for your practical driving test. When you learn to drive with us you will receive an appointment card to record your lessons and also a progress chart which your instructor will complete at the end of each lesson. We offer both male and female instructors who are fully qualified by the driving standards agency, All our cars are serviced and replaced regularly and your driving instructor will pick you up and drop you off at your home or another mutually convenient place. Whether you are choosing driving tuition for yourself or a member of your family it is important to make the correct choice first time and give you the best possible chance of passing your test first time. We offer competitive prices with quality tuition. The school has 10 cars, 4 Vauxhall Corsa’s and 1 Ford Focus ,Vauxhall Astra ,3 Ford Fiesta which are the top of the range models. They are a delight to drive, and will enhance your learning experience. Each vehicle employs Dual-Controlled pedal systems.